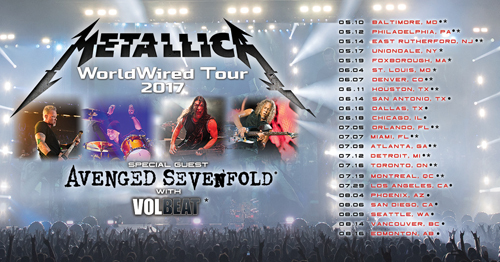 "It was one of the worst kept secrets in the touring world and now we’re here to finally make it official... yes, the WorldWired tour will be hitting the road in North America this summer for our first extended tour of the States and Canada since 2009! Whew... it certainly has been way too long and we are beyond excited to be visiting all of our friends in North America. We’re also psyched to announce that after joining us in Minneapolis last year, AVENGED SEVENFOLD and VOLBEAT have graciously signed on to be the main support acts for the run. It’s been a long time coming and we cannot wait to be a part of a good old-fashioned summer tour from coast to coast. We will see you out there!"